Slow roasting salmon is an easy and stress-free way to perfectly cook salmon for your whole family or even a crowd. 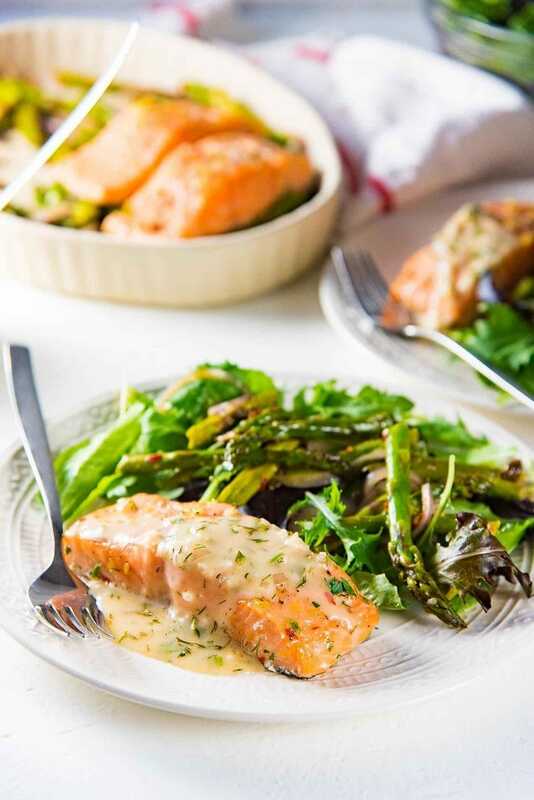 This Lemon Slow Roasted Salmon with Lemon Butter Sauce is creamy, juicy, flavorful and PERFECT for brunch, lunch OR dinner! What’s a dish that’s just as perfect for brunch, lunch OR dinner? 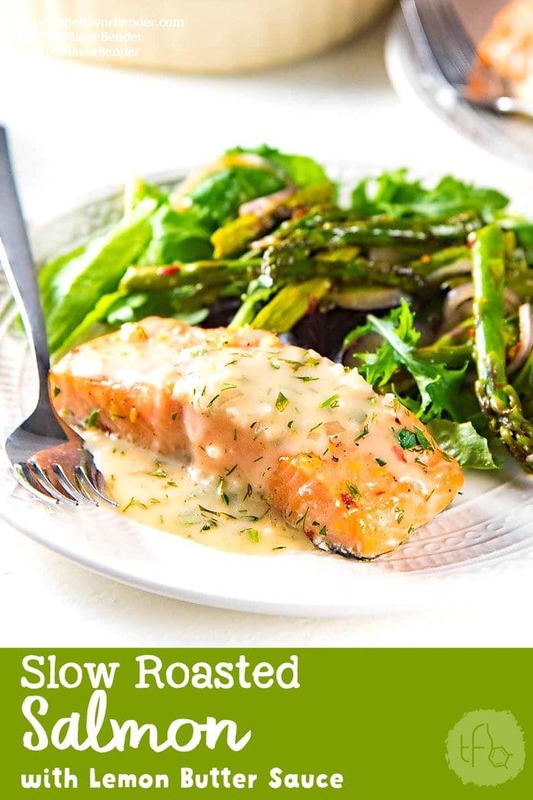 This right here folks, this Slow Roasted Salmon served with a creamy Lemon Butter Sauce is as delicious as it is versatile! Slow roasting salmon is a game changer. It’s my favorite way to eat salmon because the flesh is PERFECTLY cooked, it’s buttery and melt-in-your-mouth delicious, and so simple to cook. 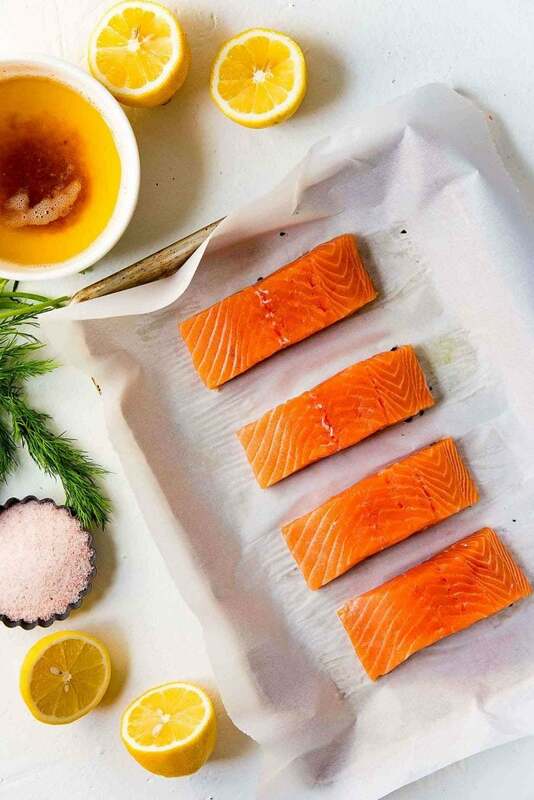 Plus, you can season and baste the salmon with your favorite seasonings or marinade. This slow roasted salmon is flavored simply with some melted butter (brown butter is even better! ), lemon, salt and pepper. But the whole is so much greater than the sum of its parts in this dish, and the flavor of the salmon really comes to life. 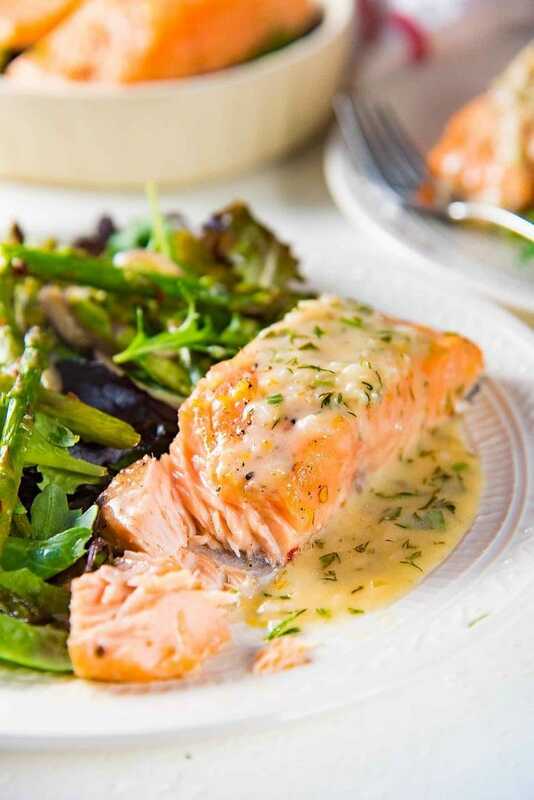 I serve this lemon slow roasted salmon with an easy sauce made with the same flavors that I added to the salmon. This creamy buttery lemon butter sauce has a nice lemony kick to it, and a good amount of garlic. 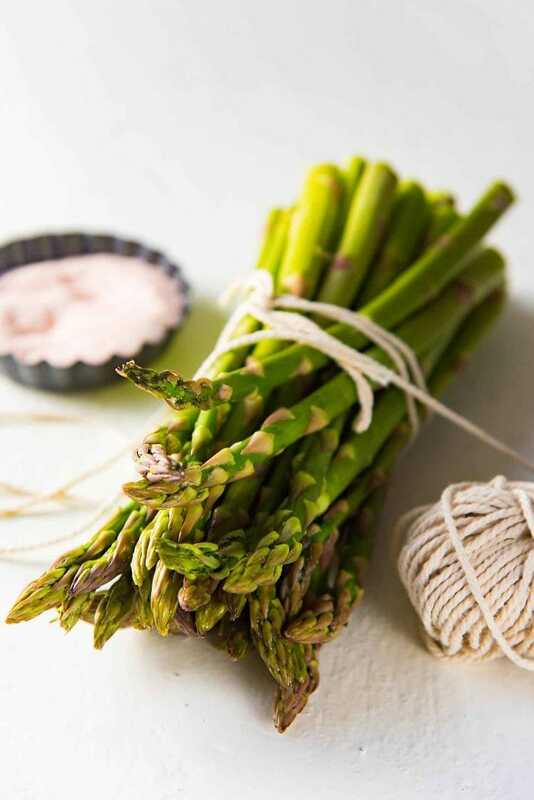 The dish is served with a side of pan-fried asparagus, red onions and a spring salad. It’s a great spring-time dish, with some simple ingredients, but big, bold flavors. Another reason why I love slow roasting salmon is because it’s the perfect way to cook salmon for a crowd. No longer do I have to pan fry salmon fillets one at a time and keep them warm till the rest are cooked. This way I can place all the salmon fillets in one sheet pan and cook them all together. I first start preparing the butter. I melt the butter (I actually make brown butter most of the time, but that’s optional). While the butter is melting, I prepare the salmon by pat drying it and cutting it into the sizes I want. I usually cut it into 3 ounce pieces for smaller portions/lighter meals, and about 5-6 ounce pieces if I want to serve this dish as a main. Then I brush the salmon fillets with the melted butter, and season them and let them marinate for about 30 minutes. While the salmon is marinating, I cut up all the vegetables and ingredients that I need. This includes chopping the garlic, shallots, red onion, asparagus and making sure the salad leaves are ready. 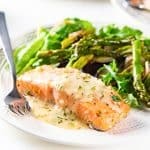 When the prepping is done, and the salmon is in the oven, it gives me just enough time to make the lemon butter sauce and to pan fry the asparagus. That’s it! You can serve a family or a crowd with this delicious and impressive meal, and this way the buttery slow roasted salmon will be freshly cooked and warm, with minimal effort on your part. The salmon is perfectly cooked. There’s really nothing better than soft, buttery, juicy salmon! The salmon cooks more evenly. Due to the low heat of the oven, the salmon cooks slowly and more evenly. While the edges might be SLIGHTLY more cooked than the middle, NO PART of the salmon is over-cooked or dry. You can flavor the salmon any way you want! Because of the low heat of the oven, the marinade and spices won’t burn. You can even add a glorious teriyaki glaze and the salmon will taste perfect with no burnt sugar bits or burnt garlic bits. But honestly, this simple lemon and butter marinade is my absolute favorite. This slow roasted salmon can be served hot, warm, at room temperature OR COLD! And it even tastes SO GOOD the next day with some eggs and toast like this egg in a hole recipe. How to check if the salmon is done? 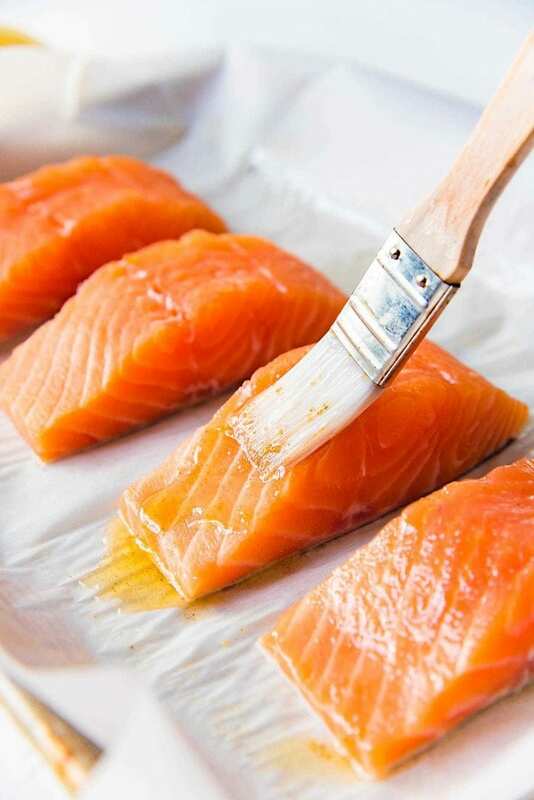 You can check the doneness of your salmon by inserting a fork or a thin knife into the salmon. If it goes in easily, then it’s ready. Another test is to gently press the top of the salmon, and if you feel like it’s just starting to flake, then it’s done. But the sure-fire way to get perfect, consistent results is with a temperature probe. So if you’re still wondering about how to slow roast salmon, you should definitely give this butter lemon slow roasted salmon a try! It’ll change the way you cook salmon for a family. And after reading this post (and recipe) you will definitely learn how to make slow roasted salmon perfectly! Deliciously soft and juicy salmon with minimal stress and effort is something I can always get behind. Perfectly cooked, juicy, slow roasted Salmon with a buttery, tangy sauce. Delicious and versatile for any meal and occasion. Please read the post for the work flow and for tips on making this meal quickly and easily. When you buy the salmon, make sure to get 12 oz (or more) of the center belly cut of salmon, so you have evenly-sized salmon pieces. Pat dry the salmon, and cut it evenly into 4 portions that weight about 3 oz each (for light meals). See notes for preparing salmon for dinner, or as a larger meal. Preheat oven to 250°F. Line a baking tray with parchment paper and brush the bottom with the melted butter (or brown butter). 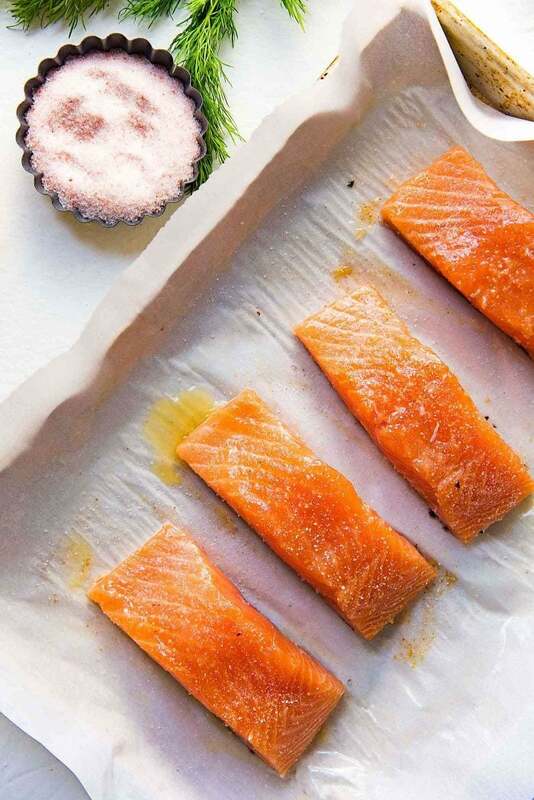 Sprinkle the buttered parchment paper with a little salt (where you would place the salmon). Place the salmon pieces on the tray with at least 1 - 1 1/2 inches of space between each piece. Generously brush the top and sides of the salmon pieces with butter. 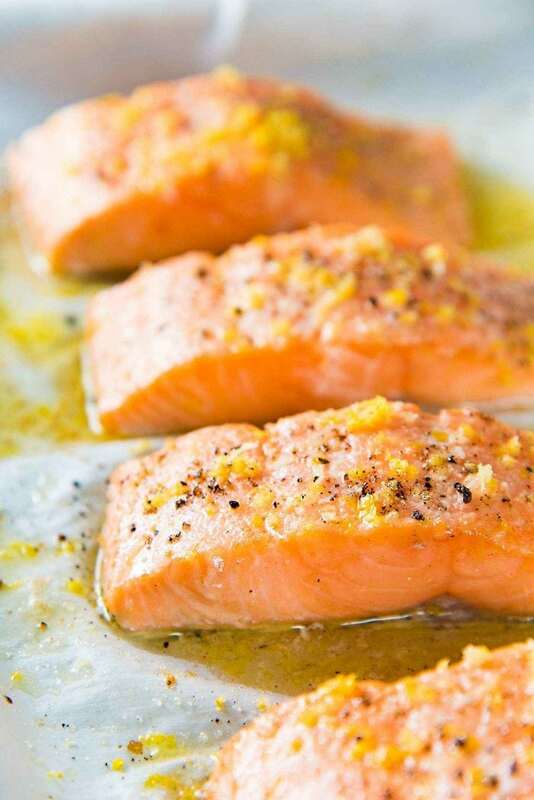 Drizzle some lemon juice (about 2 - 3 tbsp) over the salmon, followed by some sea salt. Place the salmon in the oven and set the timer to 10 minutes. Cook time may vary between 12 - 20 minutes, depending on the thickness and weight of the salmon. 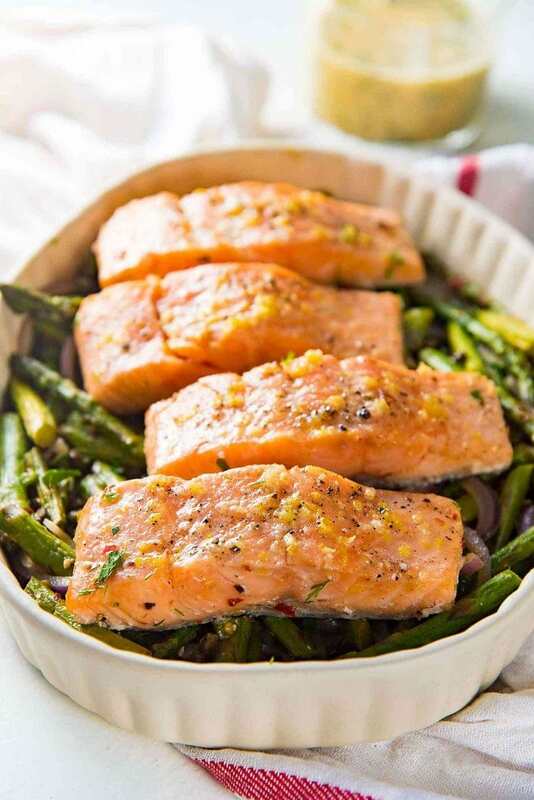 Prepare the lemon butter sauce and asparagus while the salmon is cooking. Check the doneness of your salmon after 10 minutes. A fork or thin sharp knife inserted into the thickest part of the salmon should go in easily with no resistance if it's done. OR you can check the internal temperature of the salmon - if it's 145°F, then it's done. Check every few minutes after the 10 minute mark. If the surface looks translucent, don't worry. The salmon is still perfectly cooked. When the salmon is cooked, remove from the oven and brush the top with a little more butter (optional), and sprinkle some black pepper, and zest some lemon on top. Let the salmon rest for a few minutes. In a small saucepan, combine the melted butter and lemon juice with the garlic and shallots. Bring the mix to a simmer over medium-high heat, while whisking. Whisk until the sauce has emulsified. Once the the mix is emulsified and the shallots and garlic have softened, add the sugar, water/white wine and cream. Season with salt to taste. Whisk until the sauce comes to a simmer. Remove from the heat and stir in the dill and parsley. The sauce is now ready to be served. Cut the asparagus spears in half or into 3 pieces. Place a large non-stick pan over medium-high heat with the butter or oil. When the butter / oil is hot, add the asparagus, capers and sprinkle with a generous pinch of sea salt. Leave the asparagus in the hot pan for 2 - 3 minutes to slightly char them. Add the chili flakes and red onions and toss to combine. Remove from the heat. 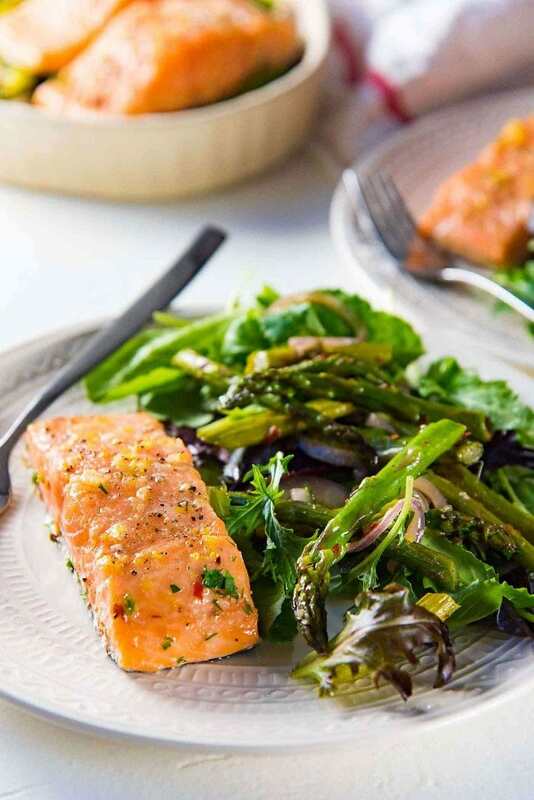 Place the asparagus on a serving platter, and carefully place the salmon over the asparagus (the salmon is very fragile, so use a spatula to move them). Sprinkle more chopped herbs (dill, parsley, or chives) on top. Serve with a spring salad and the lemon butter sauce on the side. Use 3 oz fillets for light meals (brunch or lunch), 12 ounces in total for 4 people. Use 5 - 6 oz fillets for larger mains (dinners). 20 - 24 ounces in total for 4 people. You can easily add more salmon fillets, as long as you use a larger baking tray to accommodate more salmon, and space them properly. The cook time for larger salmon fish fillets is closer to 20 minutes. Make sure to check the internal temperature for accurate results. If you see albumin being produced, then the salmon is starting to overcook, so take it out immediately. 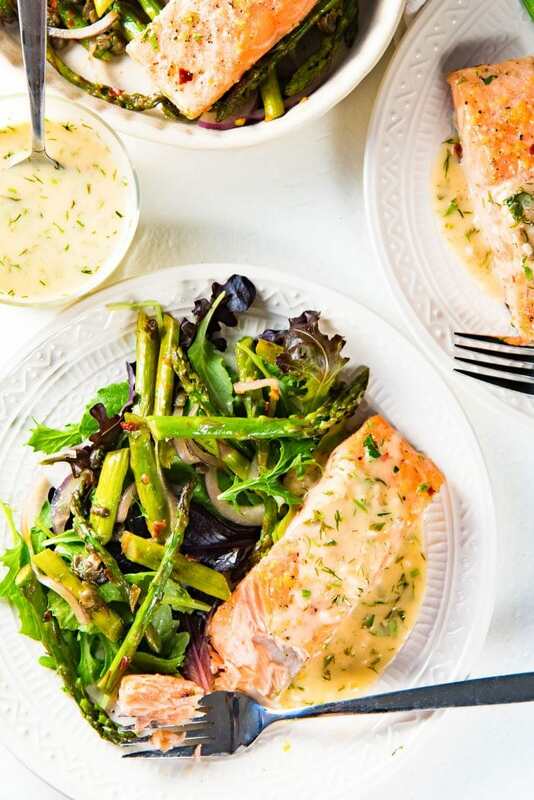 If you liked this slow roasted salmon with lemon butter sauce recipe, don’t forget to subscribe for new (and free) recipes by entering your email address on the side bar (and get all these recipes delivered straight to your inbox), so you don’t miss out on a thing. You can find me on FACEBOOK, TWITTER,INSTAGRAM, PINTEREST, YOU TUBE and GOOGLE-PLUS too. Honestly I was a little scared that I would screw this up because it seemed kinda difficult when I read it, but it turned out perfect. I’ve never made salmon before but I’m a huge fan of it and wanted to make some for my boyfriend and our son for dinner. It was delicious. I’m definitely making this again. So juicy and the flavors go so well together! This was delicious! I only made the salmon and sauce portion, and it was soooo good! 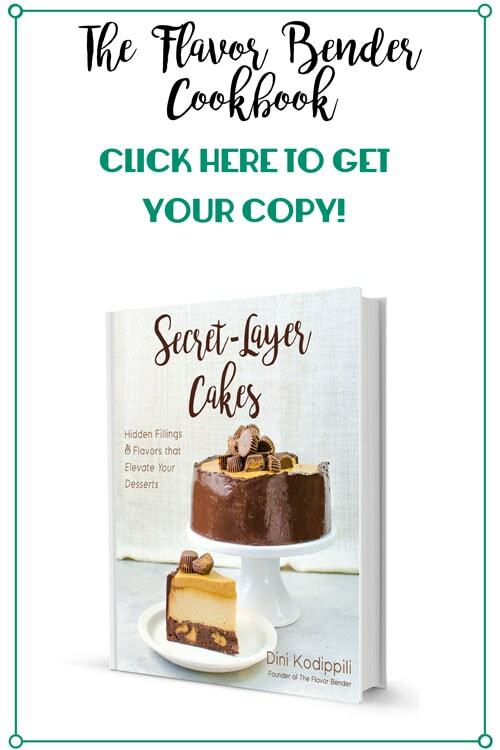 This recipe is exactly what I have been looking for! How can I incorporate potatoes somewhere either with the salmon or the salad? 1) Steamed potatoes (and asparagus) tossed in extra lemon butter sauce or as a potato salad. You could even incorporate the salad into this too. Could this be any more delicious!?! 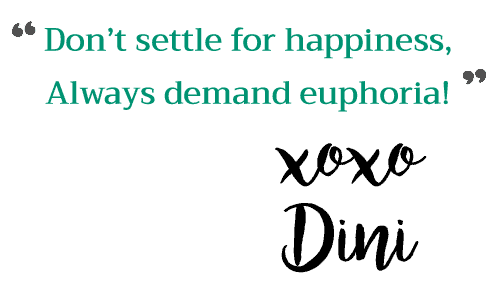 Beautiful photos and a fantastic recipe – thank you! We just LOVE salmon! Usually not really a fan of Salmon, but this was really good! The lemon butter sauce made it. Some of the best salmon I have ever made in my life! And easy too! Moist & full of flavor. I served with arugula salad & quinoa/brown rice. Keeping this recipe handy!! Thanks for sharing! I love salmon but have always hated cooking it in a pan because I never seem to get it right – the centre is always undercooked and the outside overcooked and sticking to the pan. This is the easiest way to cook salmon well that I’ve tried yet! I usually broil my salmon and it almost always ends up a bit too dry. I can’t wait to try this slow roasted salmon and definitely with that butter sauce! omg this looks so good!! Pinned and am making it ASAP! I’m always trying to eat more salmon and on the lookout for fabulous recipes. Thank you!! Question, is there another option if one doesn’t have cream? Please advise. Thanks so much Albert. 🙂 I love that combo too, it’s a simple dish, but the flavors work really well!